You could travel the earth and never find another sister as amazing as yours! 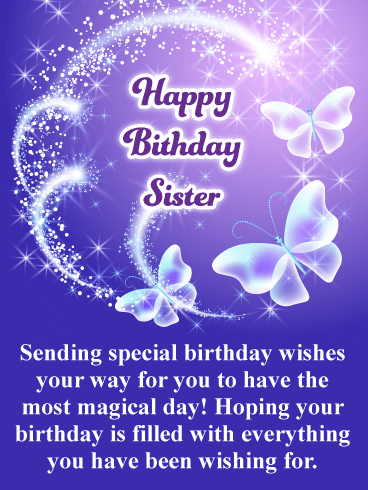 Send your sister this dazzling birthday card and wish her a fantastic day. 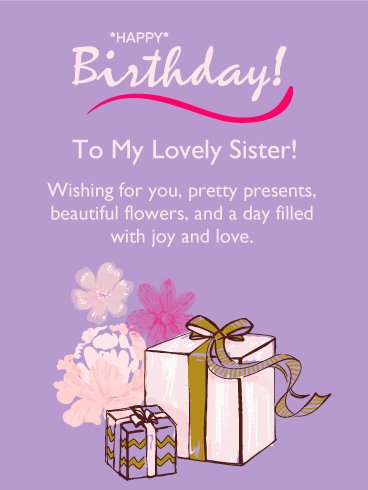 Let your sister know how much you treasure her with this gorgeous birthday greeting card. 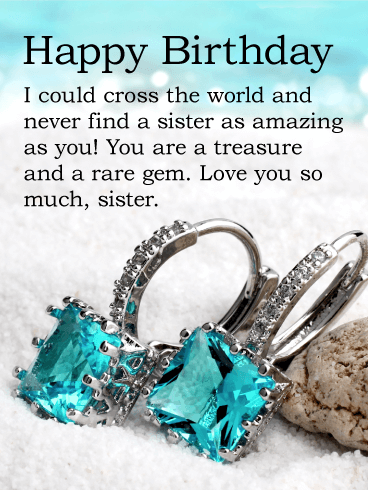 Precious gemstones by the seaside make for an elegant and attractive birthday card that will make your sweet sister feel like one in a million. Happy Birthday - I could cross the world and never find a sister as amazing as you! You are a treasure and a rare gem. Love you so much, sister. 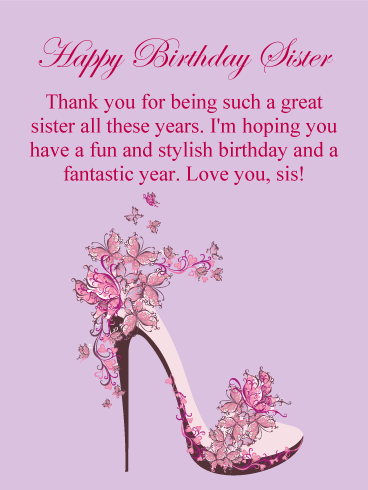 This fun butterfly and flower high heel birthday card will add some joy to your sisters birthday this year! It was creatively designed with colors of bright pink and yellow, festive colors that represent her special birthday celebration. The message will make her smile as she reads that she still looks young and fashionable! 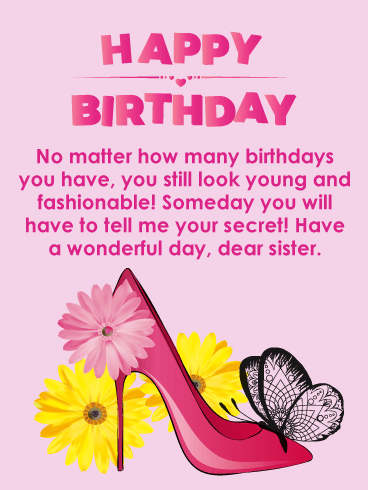 Something every sister would love to read on their birthday! 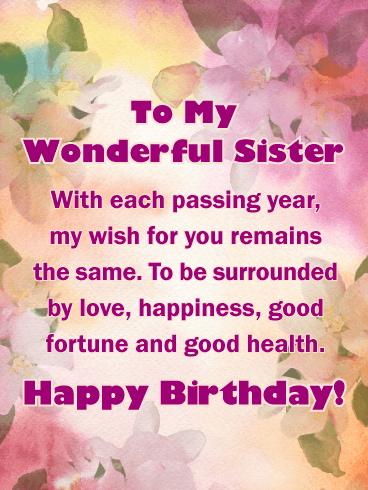 Be sure to send this greeting card out today, to wish your sister a wonderful day. Gold and pink presents give this birthday card an elegant look that will surely impress your sister on her birthday. The perfect gift boxes sit beautifully next to pretty pink flowers, and the gold lettering adds a classy look to this birthday card. 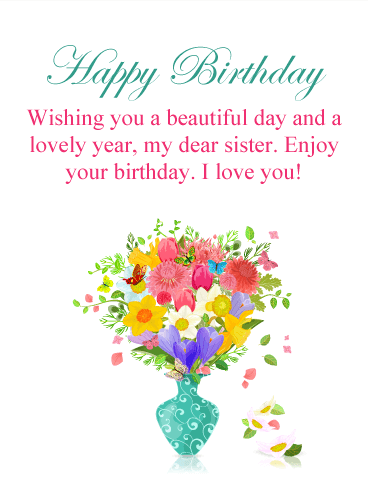 You sister deserves a day filled with joy and love so make sure to send this exquisite birthday card to her on this very special day. Your sister will be so happy you did! This exciting birthday card features shining pink and golden heart balloons with festive confetti! Your sister is just adore it! 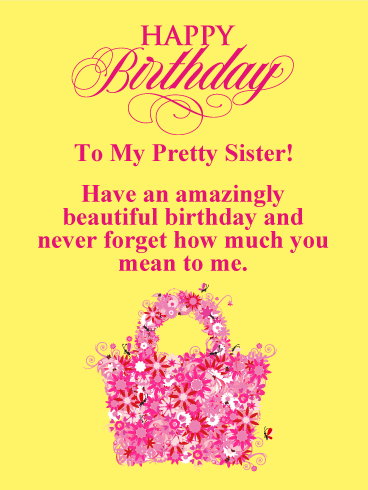 It wishes her an extra special birthday and will also thank her for being such a great sister. 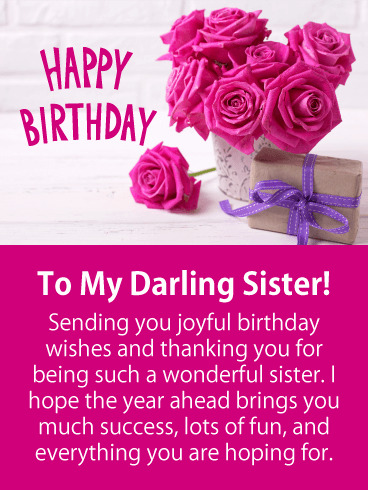 This birthday card has it all and it will get your sister's birthday off to a wonderful start! So send these beautiful birthday hearts her way to tell her you love her and wish her a special day! Dazzle and delight your sister on her birthday this year! 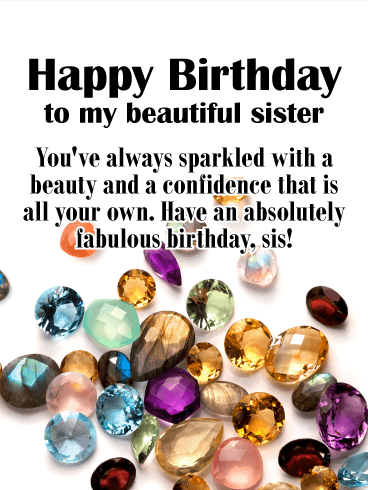 Send a card that glitters with jewels so your sister knows what a rare gem she is. 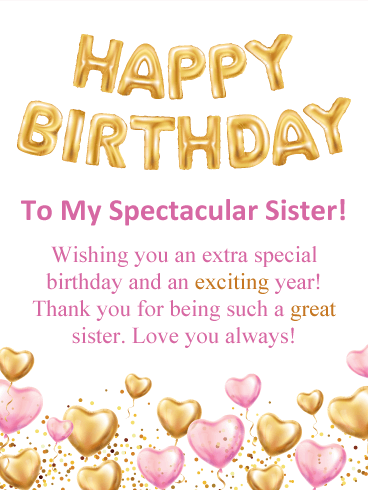 This birthday greeting card for a beautiful sister is full of sparkles and heartfelt affection. On your sister's birthday, she'll love receiving a gorgeous birthday card to help her celebrate the day in style. 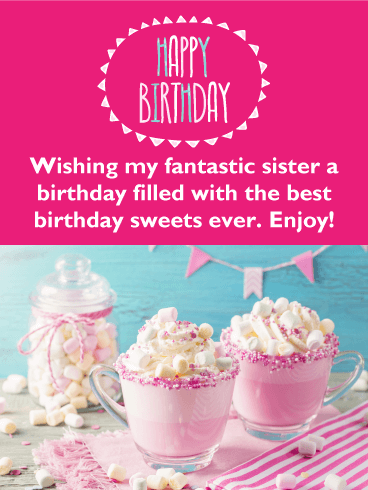 If your sister is a lover of fine sweets, then she will enjoy this birthday card. It features irresistible dessert drinks complete with sprinkles, tiny marshmallows, and delicious whipped cream. So good! There would be no better way for your sister to start her birthday than with this awesome greeting card. The Happy Birthday lettering matches perfectly with the deserts and looks great against the pink background. Don't make your sister wait, sent these birthday sweets to her today! If you have a sister that appreciates the finer things in life, then you will want to send this exceptional birthday card her way. It features a beautiful pink butterfly high heel shoe that is the essence of fashion! This beautifully designed shoe will have your sister wishing she had a pair. She will also be touched that you are thanking her for being such a great sister. She couldn't ask for a better birthday card then this! This adorable puppy loves flowers, and she wears them well! If your sister is a dog lover, she will absolutely love this birthday card! 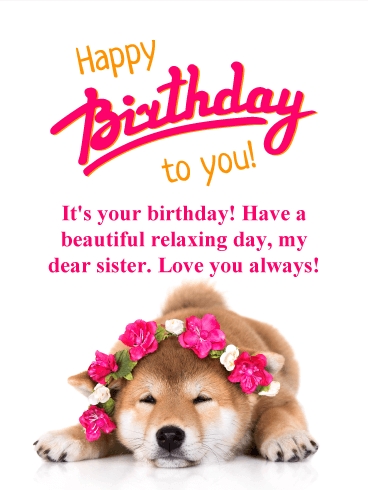 The sweet dog, the pink and orange colors, and the great message makes for a wonderful birthday card that will brighten your sister's special day! So send this cute dog over to your sister to wish her a beautiful and relaxing day, she will certainly appreciate it!